Joe has provided a Sun detergent review. At first, I was skeptical about Sun. My mother has always used Tide. She claimed that Tide was the only detergent strong enough to keep three rowdy boys' clothes respectable. When I started washing my own clothes, I naturally chose the cheapest brand of detergent I could find. However, I had to admit, the generic and store brand detergents just did not get the grease, grass and mud stains out like Tide. This is why I had major reservations about switching to Sun. My first few laundry detergent purchases as a newlywed had, of course, been Tide. I came in from work one day and saw that my wife had been to the grocery and purchased Sun detergent. When I asked why, she replied that clothes washed in Tide were irritating her skin and causing a small, red rash. She had found that only two brands of detergent never caused such an outbreak; Sun and Purex. Between the two, Sun was the cheaper. While I could not argue with her logic about rash prevention, I was not excited about the cleaning power of Sun, given my upbringing. I was very pleasantly surprised with the first load of clothes I washed with Sun. They came out every bit as clean as those washed with Tide. I was also impressed with the "sun fresh" scent. Tide seemed to leave a more "detergent-like" smell, whereas clothes washed in Sun came out smelling more neutrally clean. My most happy surprise came the next time I was tasked with doing our grocery shopping. Not only was Sun cheaper than Tide at our local grocery, it was the cheapest name brand detergent available! Needless to say, we have been a Sun family now for 15 years. I continue to be impressed with Sun's cleaning power, scent and overall value. Thanks Joe for sharing your Sun detergent review. It is great when you can find a product you like that is also inexpensive! Does anyone else have an opinion about this detergent? 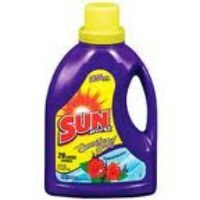 If so, you can share your Sun laundry detergent review here. In addition, you can share any other laundry detergent review here, telling me which brand you think is the best, and why. 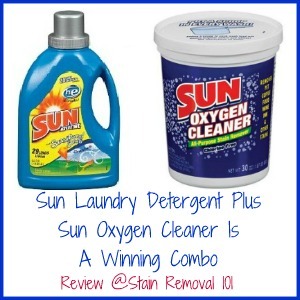 An SR101 reader shared how she combines two Sun laundry products, the detergent and oxygen cleaner (basically a cheaper version of Oxiclean) to make what she feels is a wonderful combination. 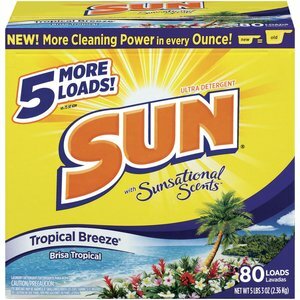 I have been using Sun Laundry Detergent combined with Sun Oxy powder for a few years now. It works great and the price is way more affordable than the other brands. When you use the Oxygen Cleaner on your whites they come out clean, bright and stain free. I too have had bad allergic skin rash's from Tide and never use it. Sun is gentle on your clothes and skin, causing no irritations at all. 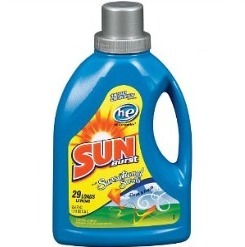 The HE Sun doesn't have a strong scent and since it's the only kind I can use in my front loader I don't know what the other Sun detergents smell like, however I prefer it that way. The clothes are simply clean and have little to no scent at all, because they are clean. That is as good or better to me then having a fragrance added. I would highly recommend this detergent paired with the Oxy Powder from Sun. You can't beat it! Thanks so much for sharing your review of this detergent and oxygen bleach. I'm definitely a big fan of oxygen bleaches for many types of stain removal, so it's always great to hear a review of a lower cost version than the leading brand, Oxiclean. It is hard to find Sun Oxygen Cleaner online, but I know I've seen it at Walmart , so you should be able to pick it up there. I'm sure it's available at other stores too, but that's where I've personally seen it. I liked them both. This was new bottle design and both said "triple clean." Our grocery store had the smaller bottles on sale for $0.98 last week. I had been using Arm and Hammer for the last year, but I couldn't pass up this deal. I bought six detergents, all the mountain fresh scent but two. I thought they did great. The clothes smelled great. They looked clean - and neither formula irritated our skin. My son and I both suffer allergies - and most detergents make us itch, or cause small rash. So far so good. It seems to rinse clean. I tried Tide and Cheer and they both make us itch. The Arm & Hammer didn't leave clothes smelling "fresh," and Purex also irritates our skin. My budget doesn't stretch far these days, but I will definately buy the Sun detergents again. They were affordable and concentrated -- it doesn't take a full cap to wash either. I was impressed with both the price and the quality. For 98 cents I certainly didn't expect such good results. Robin shared how she had a bad allergic reaction to Wisk detergent (you can read her experience with that detergent here), and how she eventually switched to Sun because of it. Now I knew that it was an allergy causing my rash. Giving up on everything I went to the store and bought some Purex powder. I immediately came home and washed my sheets and some clothes and my rash got even better. I didn't like the smell of it though so I went to the store again and bought the Sun Tropical Breeze powder. I've been a Sun user before in this scent but in a liquid. Well, after a week and a half of using the Sun powder my rash on my waist (and other places) is completely gone, other than some minor discoloration from having it for so long. So two thumbs up to this Sun powder. I can't say that it was the end all to my rash but I can say that it helped. A lot. It's also really cheap. I got 80 loads for $5 at Walmart, and for someone on a budget, that's a great deal. I don't believe it has the awesome cleaning power Wisk does, but it works well enough for me and if it's helping keep my rash at bay, even better. Thanks for sharing your review Robin. I'm glad that you found a low-cost product that doesn't bother your allergies. While you have found this product a relief some people have actually reported that they got rashes or hives from using various versions of this product. You can read readers Sun allergic reaction experiences here if you're interested. Due to the good reviews of this product I bought a big bottle for about $3. However, every time I used it I noticed the rinse water was always colored. I thought maybe it was a new piece of clothing in the wash, but after checking a few times of washing with it and noticing color in the rinse water each time I realized it was the detergent. After switching back no more colored rinse water. However, Sun with color safe bleach powder is great. I don't use liquid bleach anymore just that. Jessica has provided her Sun detergent review of the Tropical Breeze scent. I am currently using Sun with Sunsational Scents. It is liquid and the scent is Tropical Breeze. I really like this detergent for the price. It is under two dollars for a 50 load and gets the job done. I like that the price is good for people that are on a budget, like me. The scent is not that strong and you would need to add fabric softener in order for your clothes to smell strongly even out of the dryer though. The scent is very faint, but I like that. It does get out mild stains but for soaked in stains you would need to add a stain remover to your fabric. It does not seem to effect any part of wear and tear on my family's clothes. It also seems to be very gentle for sensitive skin. I currently even use it for my newborns clothes and have not noticed any sort of rash on her due to the fragrance or chemicals. Overall I would recommend this product if you are looking for a soap to wash, clean, and remove light stains while adding a light scent of fragrance. 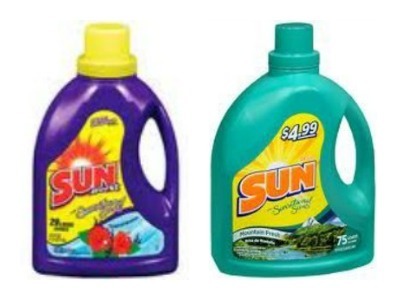 Thanks Jessica for your Sun laundry detergent review. It is great you've found a detergent you really like for a low price. In these hard economic times that is something more and more of us are searching for, not with just laundry detergent, but almost everything. Has anyone else used this detergent? If so, you can share your Sun laundry detergent review here. In addition, you can share your laundry detergent review here of any brand, telling me what you like, or don't like, about it. I decided to try Sun detergent for the first time in November 2013 and ended up with a load of ruined laundry (I've had my washing machine for three years and have never had this problem before). I contacted the help hotline and was instructed to send them an itemized list of damages along with the bottle of detergent. After over three months of terrible customer service, unreturned calls, and empty promises I can definitively say I will NEVER buy any Sun products again and will readily advise others accordingly. I have been looking for the Classic Sun powdered detergent with Colorsafe bleach. It looks as if Sun no longer makes this. I am very disappointed as I have read so many good things about it. Why do companies also do this? Change something that works!!! I am not fond of their new products, now. My daughter and husband started working on a horse ranch a couple months ago, and they come home with some pretty dirty clothes. For the first few loads I washed with Sun Tropical Breeze Scent, the clothes seemed clean enough. However, after several washes, it became clear that the Sun was not removing the smells from the horses and the sweat. The clothes didn't look dirty, just stained, but they were smelling horrible, especially my husband's because he tends to sweat a lot. I tried soaking and rinsing with vinegar (as suggested in multiple blogs for removing smells) and also drying in the sunlight to kill germs, after washing with Sun. Still, they stunk. I ended up buying a small bottle of Tide, and the clothes smelled clean after just one wash, with no hint that there was ever any body odor or horse poo smell. I've never been a fan of Tide due to how expensive it is, but I was desperate. I've still got about half a big bottle of Sun left, but even our not-so-dirty laundry is now coming out of the wash a little stinky after using it. However, I do find that Sun smells really good before it goes into the washer, and like I said, it worked okay the first few times I used it. I wish it had worked better for us because the price absolutely cannot be beat. I had been reading a lots comments on Facebook about how people liked Sun and how good it cleaned, as I was out of detergent and had to purchase some I thought I would give Sun a try. I bought four 188 oz bottles. I must say after my first wash of white clothes I was very impressed Sun. It has won me over. Great smell and cleans great. I was very impressed. So inexpensive, can't believe so much for so little. I always grew up using either Gain or Tide products, and although I still love both of those brands they just aren't budget friendly (unless you have some great coupons & a local Winn Dixie store). I found the small bottle of Sun Tropical Breeze for only $1.98 & not only does it smell AMAZING but it gets the clothes clean and most stubborn stains out. For the really tough stains I found that using Shout gel stain remover with scrub brush with the Sun products works just as good if not better than more expensive name brand products. We have been using Sun for about 4 years now and as long as the product remains the same then I see no reason to ever switch back to the more expensive brands. I'm on a hunt for this brand. I've tried all kinds of combos for whiter and brighter whites and armpit discoloration. This did what I've been trying for years to do. Impressed.